Formed in London in 1871 as the Army and Navy Co-operative Society by a group of military officers to supply consumer goods at the most reasonable prices, the Society grew steadily and received many requests to serve the needs of homesick military personnel and civil servants in India wanting something from ‘Home’. The first Indian Army and Navy Store was opened in Bombay in 1891. 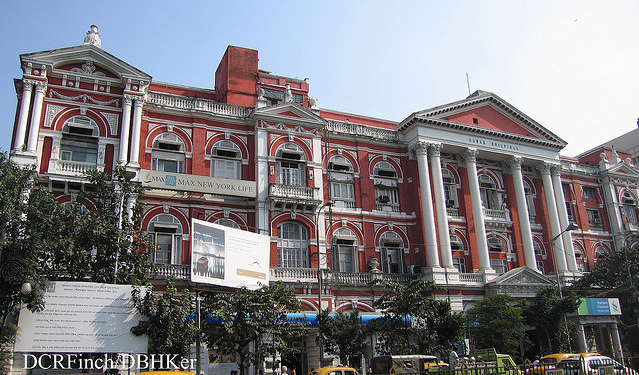 The Calcutta branch opened to great fanfare in 1901. “At its height — between 1890 and 1940 — the Army and Navy Stores was more than a mere emporium: it was a key cog in the machinery of the Empire. The two greatest jewels in the Stores’ crown were the enormous branches in Calcutta and Bombay, which functioned as travel agents, bankers, caterers, undertakers, and insurance brokers, as well as purveyors of the pith helmets, thunder-boxes, plum puddings, and all the other myriad things listed in the Army and Navy’s catalogue, which ran to more than a thousand pages. This catalogue was the bible of the British Raj. Kipling’s Mrs. Vansuythen and Mrs. Hauksbee would have been unable to function without it.” See The Sorcerer’s Apprentice by John Richardson. Now known as the Kanak Building. This entry was posted in Commercial Houses, Establishments, Shops/ Markets and tagged army and navy co-operative society, army and navy store, army and navy's catalogue, buildings, calcutta, departmental stores, old calcutta, stores.